All flies in the Oestridae are highly specialized for parasitism so that the entire feeding to maintain the life-cycle is done by the larvae. This specialized life-cycle defines oestrids as obligate parasites. The adults have only vestigial mouthparts remaining from this adaptation, so they cannot feed. Larvae distend with much food to support the adult stage with all material and energy reserves for reproduction. 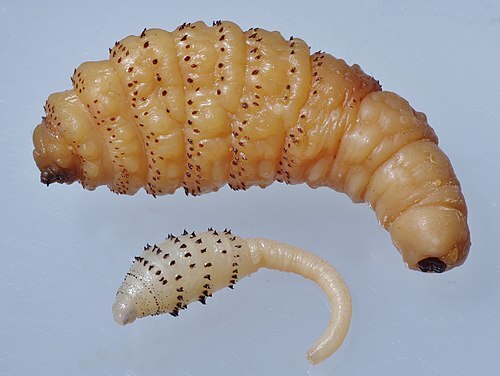 Photograph shows a mature and an immature larva of the Torsalo Bot-fly, Dermatobia hominis, parasite of cattle and humans, causing furuncular myiasis. Adult flies are robust and actively fly long distances in search of mates and hosts for their larvae. It may be difficult to find these adults and identification focusses on characters of the larvae. Adults have a distinctly characteristic appearance, like that of Bumble-bees: furry and with colored stripes. Host animals can often recognize and flee from the approach of adult flies.The posterior spiracles of larvae have highly characteristic patterns, but the anterior spiracles are absent or obscure. The posterior spiracles of oestrid larvae form a pair of large flat plates with numerous small openings. This contrasts with posterior spiracles of calliphorid larvae which are usually a trio of slits surrounded by a peritreme (see Blow flies). Diagram of feeding in skin represents Hypoderma Warble-fly larvae, causing migratory myiasis. Larvae burrow within the skin and sub-cutaneous tissue of its host (scales are not accurate). Larva at left is migrating through sub-cutaneous tissues. Larva at right is preparing to mature under surface of skin, forming a warble. This maturing larva has not yet turned into its final position so that its spiracles face to external air through a hole that it will cut through the skin. Avoidance behavior = Some animals that are natural hosts of oestrid flies recognise the approach of adult females and will run away in panic to avoid the flies. Furuncle = An abscess or boil in the skin of a host caused by infestation with an individual myiasis larva. Gadding = A vernacular term for avoidance behavior. Obligate myiasis = Infestation of skin and other organs by dipteran larvae where the parasitism is essential to survival and reproduction of the flies. Phoresy = Use of another animal by a reproducing animal to disperse its eggs or offspring. Spine = A projection of the body wall to form a sharp gripping structure (2 on Gasterophilus). Tubercle = a rounded protrusion of the body wall (4 on Rhinoestrus). Vestigial mouthparts = Adult oestrid flies gain all nutrients from their larvae - only traces of their mouthparts remain (6 on Rhinoestrus). Warble = Vernacular term for a furuncle caused by a single oestrid larva in the skin. Characters: larva, adult dorsal. 1- Prominent rasping mouthparts. 2- Larva has rows of small spines on bands at ventral surface of each segment; dorsally mature larvae have dark bands on each segment; fleshy projections are absent. 3- Posterior spiracles on a nearly circular plate, without indentation, and with many openings in pattern of rays. 4- Antenna has large arista without setae. 5- Head bears numerous small tubercles; eyes are small relative to head, and with a large gap between them. 6- Wings are clear; vein 4 of the wing joins vein 3, it does not reach the wing margin directly. 7- Adults have thorax and abdomens with mottled patterns of black on grey; mouthparts are vestigial. Hosts: Oestrus ovis (Nasal bot-fly of sheep) larvae infest the nasal cavities of sheep and goats. Signs and disease: Infestation causes irritation, head-shaking, sneezing, nasal discharge, distress and avoidance behavior. Apart from the danger of a heavy infestation of larvae in the head, the behavior of tightly packed defensive flocking (Fly-syndrome) causes lost production . Characters: larva, head of adult. 1- Prominent rasping mouthparts. 2- Larva has rows of small spines on bands at ventral surface of each segment. 3- Posterior spiracles on oval plate that has a deep indentation, and with many openings in pattern of rays. 4- Head bears numerous large tubercles. Eyes are small relative to head, and with a large gap between them. 5- Antenna has a large arista without any setae. 6- Mouthparts are vestigial. Hosts: Rhinoestrus purpureus (Nasal bot-fly of horses) infests the nasal cavities of horses and donkeys. Signs and disease. Irritation, head-shaking, sneezing, nasal discharge, and lack of coordination are caused. Distribution. Flies of this genus inhabit Eastern Europe and Russia. Characters: larva. 1- Large rasping mouthparts. 2- Segments 2 to 9 bear large stiff fleshy projections. 3- Anterior segments also have bands of small spines. 4- Spiracles are on an oval plate with a broad indentation; openings form a scattered pattern. Hosts: Cephalopina titillator (Nasal bot-fly of camels) infests the nasal cavities of dromedary camels and bactrian camels. Signs and disease: Irritation, snorting and sneezing, bleeding from nostrils, lack of coordination: these all lead to reduced production of milk and body weight gain. Distribution: Dry regions of Sub-Saharan Africa and Asia are inhabited, also Australia where introduced dromedaries may be infested. Characters: larva, adult dorsal. 1- Larva has paired of bands of spines on dorsal surface; the spines here have points facing each other; there are no fleshy projections from the surface of the larva. 2- Posterior spiracles form open rings, with groups of openings arranged around each ring. 3- Antenna has large arista without setae. 4- Eyes are small relative to head, and with a large gap between them. 5- Wings are clear; vein 4 of the wing reaches directly to the leading edge of the wing. 6- Adults are large; thorax and abdomens have a dense covering of fine setae in bands of brown and yellow; mouthparts are vestigial. Hosts: Cattle are infested by Hypoderma bovis and H. lineatum (Warble-flies or Gad-flies). Hypoderma diana infests deer but may also infest sheep although without being able to complete its larval development there. Similarly humans may become infested, but rarely. Signs: Larvae hatch from eggs laid by the female directly on leg hairs of hosts. Hatched larvae immediately burrow beneath host's skin and migrate through connective tissues and muscle to appear one year later as mature larvae along the back. As the larva matures it forms a distinct furuncle in the skin; this is the warble . Disease: Migratory myiasis followed by furuncular myiasis reduces the value of meat and hides. Avoidance behavior of cattle as they panic to escape when approached by female flies, leads to stress and injury from collisions (this behavior is often called gadding). Characters: larva, adult dorsal and lateral. 1- Larvae have 2 rings of backward facing spines on the anterior segments; rasping mouthparts are large. 2- Larva at second stage of development has posterior segments elongated and narrow. 3- Larva at third stage of development has posterior segments thick and not elongated. 4- Terminal segment of stage 3 larva is sclerotized and spiny; its spiracles have 3 openings parallel to each other and they are not surrounded by a distinct peritreme. 5- Vein 4 of wing reaches directly the outermost point of the wing. 5- Thoracic squama is large and without setae. 7- Adults are large, with a yellow/brown thorax and metallic blue abdomen; eyes are orange and side of face is white. 8- Antenna has an arista with setae on one side. 9- Side of the head is broad; mouthparts are vestigial. Hosts: Cattle, sheep, dogs, birds and occasionally humans are infested by Dermatobia hominis (the Torsalo-fly, Human bot-fly, Berne, Nuche, and other local names) . Signs and disease. Furuncular myiasis of the skin is highly characteristic. Pain and severe distress leads to reduced feeding time, loss of production and damage to hides. Distribution: These flies inhabit Central and South America, from Mexico to Uruguay. Note: Of this genus the important species, D. hominis, has a specialized method of getting its eggs onto its mammal host. The female lays small batches of eggs on a blood-sucking insect. When that insect lands on its host to feed, the additional warmth stimulates the larvae of D. hominis to emerge then rapidly burrow into the mammal's skin. This is an example of phoresy. Individual larvae continue to develop at that site, forming large furuncles. The furuncles tend to be grouped together where the original carrier insect fed on blood of host. Furuncles become large and suppurating as the larvae develop. The mature larva emerges, drops to the ground and pupates. Characters: larva, adult lateral. 1- Fully mature larvae are stout and covered in scale-like spines. 2- Posterior spiracles of larvae are kidney shaped and with many fine, curved openings. 3- Alula of the wing is conspicuously large. 4- Abdomen and thorax is densely covered with short setae. 5- Mouthparts are residual. Hosts: Principally rodents and rabbits are infested, but cats and dogs are sometimes infested. Signs and disease. Furuncular myiasis of the skin is caused. The female fly lays eggs at nests of its hosts. Larvae then penetrate the host's skin and develop beneath the skin, forming large nodules. Larvae infesting cats occasionally penetrate the brain with serious consequences. Distribution: Warm climates of South and North America. Characters: larva, adult dorsal and lateral. 1- Large rasping mouthparts are prominent. 2- Larva has bands of large backward pointing spines around the full circumference of most segments; there are no fleshy projections. 3- Posterior spiracles form oval plates, with 3 elongated curved openings on each plate; spiracles are within a deep depression in the last segment (anterior spiracles usually visible as small bunches of protruding tissue). 4- Abdomen of female is long and extends in a fold underneath the main body. 5- Antenna has large arista without setae. 6- Mouthparts are vestigial. 7- Wings have dark patches; vein 4 of the wing reaches directly to the trailing edge of the wing. 8- Thorax and abdomen are covered with a dense covering of fine setae which are dark brown or yellow in a patchy pattern; eyes are dark brown. Hosts: Horses and other equids including zebras, also elephants and rhinoceroses . Signs and disease: Vigorous avoidance behavior occurs when adult flies chase their hosts. Initial infestation causes stomatitis and ulceration of the tongue; loss of appetite and even threat to life from inflammatory restriction of host's esophagus. However, larvae maturing in the stomach seem to cause little ill health, despite infestations here sometimes being heavy. Note: The adult female fly lays eggs on the legs of her host. When the larvae hatch they crawl on the skin, stimulating the host to groom by licking. The larvae then establish their infestation in the mouth of the host, followed by migration to the stomach. ↑ Yilma, J.M. ; & Dorchies, P. (1991) Epidemiology of Oestrus ovis in southwest France. Veterinary Parasitology, 40: 315-323. ↑ Otranto, D. (2001) The immunology of myiasis: parasite survival and host defense strategies. Trends in Parasitology, 17: 176-182. ↑ Jelinek, T., et al. (1995) Cutaneous myiasis: review of 13 cases in travelers returning from tropical countries. International Journal of Dermatology, 34: 624-626. ↑ Edwards, G.T. (1982) The prevalence of Gasterophilus intestinalis in horses in northern England and Wales. Veterinary Parasitology, 11: 215-222. This page was last edited on 19 November 2016, at 17:46.